Welcome to the weekly High Five For Friday link-up hosted by Tif @ Bright On A Budget, Katie @ Cup of Tea, Becky @ BYBMG and myself. We're glad you're here! High Five for Friday is where we come together to share five highlights or five favorite things from the past week each Friday. 1) Raylan has been very sick for the last week. Thankfully he is on the mend now. He was finally able to enjoy a day at Story Time this week with his friends. They had the cutest little St. Patrick's Day Party. 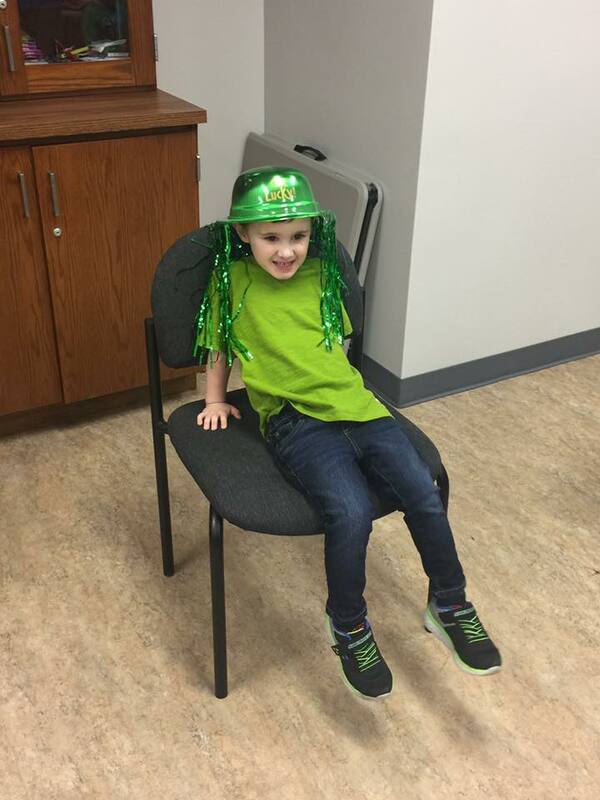 Look how adorable he is in the St. Patrick's Day hat! 2) We had a decent amount of snow this week which was very unexpected. We had probably 3-4 inches. Snow is beautiful but I am more than ready for Spring. 3) I had my first ever trip to Rural King this week and I must say that I love that store. I fell in love with their porch furniture and Raylan fell in love with the baby chicks. He wanted to bring them all home with him. He also loved the fact that you get free popcorn there with every visit. 4) Since Spring is so close, I have been pinning and planning overboard. Does anyone else feel the urge to want to redecorate when warmer weather is near? 5) Today I take my math portion of the Praxis Exam for the teaching program. All of your prayers would be greatly appreciated. This week's featured blogger is Christina from The Patricio's. Christina is from California. She is a wife and a mom of two. She is a lover of Disneyland, holidays, food, fashion and celebrities. You can find travel tips, recipes, home decor and so much more on her blog. Please stop by and say hello to Christina. Thanks for stopping by! Don't forget to link-up below. Have a blessed and safe weekend!